The Moscow Metro is the most popular and convenient means of transport in Moscow. It looks very different from subways in other European capitals. Each station has a unique and individual design. The halls are finished with marble and lit with chandeliers; walls and ceilings glitter with mosaics and stained-glass windows. It comes as no surprise that it was often called ‘marble palaces for the people’. The first metro line was launched in 1935. It seemed the whole country was involved in its construction. The best architects of the time were asked to design metro pavilions and underground lobbies. Marble and other natural stones were brought from all corners of the Soviet Union. More then 75000 ordinary people were employed on the project. The Metro was created not only to carry passengers - it was the greatest PR project of the time. The Metro is an underground gallery of Soviet realist art. This art was meant to depict ‘the real’ Soviet life. The people in these images look happy: they are confident in their future. Collective farm girls seem to have fun working on the fields. Workers are never tired. The life in the country was shown as a never-ending festival. 70-80 meters underground. 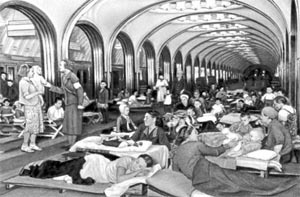 During the Second World War the city’s metro stations were used as air-raid shelters, and many of the larger stations were used for important political and tactical meetings. The Metro in Moscow is expanding. Some of the modern stations look as impressive as the old ones but unfortunately the Muscovites are so much in a hurry that they never look around. It seems that only the tourists have the time to appreciate the beauty of our Metro! 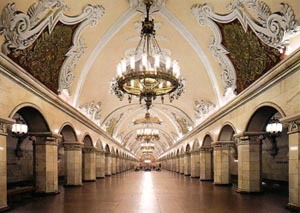 Don't miss the opportunity to visit the Moscow metro. But it’s very important to avoid the rush hour (8-10am, 5-8 pm). Your Moscow tour guide will show you the most impressive stations. But you can also explore on your own. The must-see stations include Ploshadj Revolutsii, Mayakovskaya, Novokuznetskaya, Komsomolskaya, Novoslobodskaya.